Two weeks ago, on Tuesday, 25 August 2015, the funeral of my father, Robin Wilson, took place at the Oratory Church of St Aloysius, Oxford, followed by burial at St Michael's Churchyard, Cumnor. 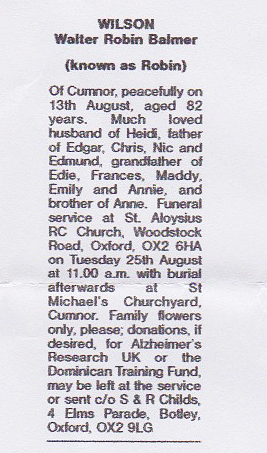 Dad had died on Thursday, 13 August, aged 82. 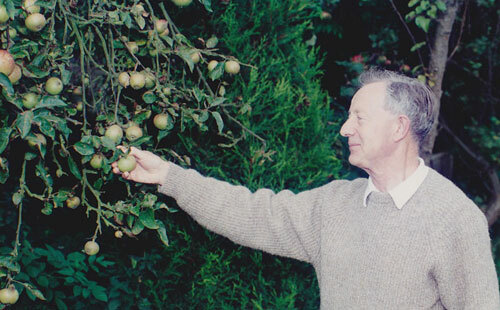 Looking back on his life, I am struck by his great gentleness and kindness. 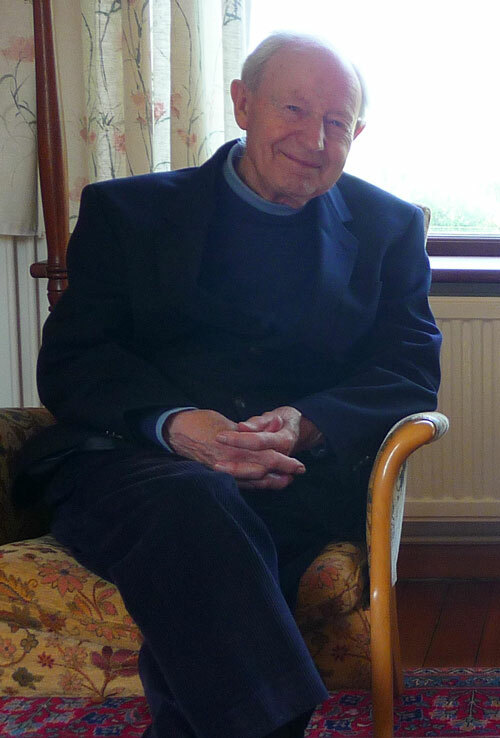 He was a loving father, a quiet and scholarly man who enjoyed being at home with his family. He relaxed by reading about history, language and religion, making copious notes in his beautiful handwriting. 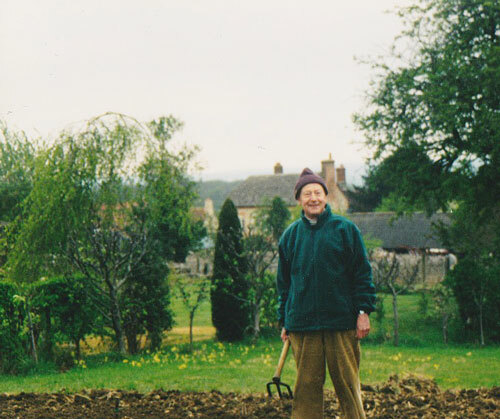 He also loved working in the vegetable garden, growing food for our dinners. 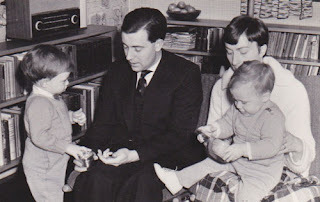 My early memories of Dad are from when we lived in Aylesbury and then in Oxfordshire in the mid to late-1960s. I remember the excitement of receiving a big tricycle that he and Mum gave me one Christmas in Aylesbury - and my grandfather - Dad's Dad - visiting and giving me a helpful push on it. When we moved to Cumnor in Oxfordshire in the late 1960s, I recall the time Dad spent with me and my brothers in the garden. When I obtained my first camera, a Kodak Instamatic, he was very happy to pose for me. I recall him, showing me his vegetable plot and pulling out a huge carrot destined for Mum's delicious winter stew. Dad taught me how to use a bow and arrow - the arrows had a rubber suction pad at their end to limit the damage they could do. He also erected a little round, metal-sided swimming pool to splash around in. We were in heaven! I would shoot arrows at it which would stick on the side. 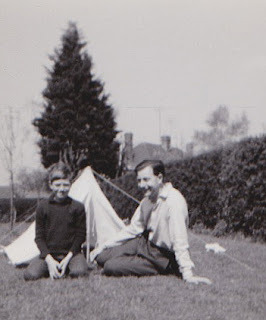 We also played in a tiny tent which he had erected for us, and Dad took my elder brother and me blackberrying on our bicycles. One night we rode back as the sun was setting, our bags bulging with berries. I can rarely recall a happier day. Dad had an interesting background. 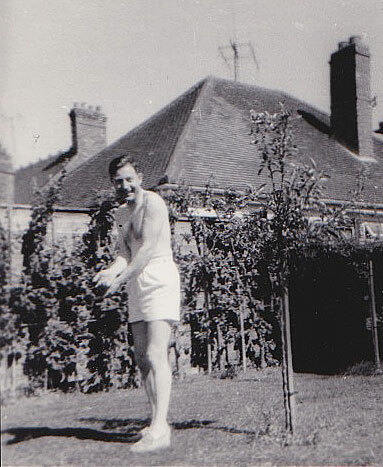 His father had worked as an oil company executive while embarking on his own enterprises, buying a petrol station and dreaming of launching a greyhound track in Chester, to my grandmother's horror. 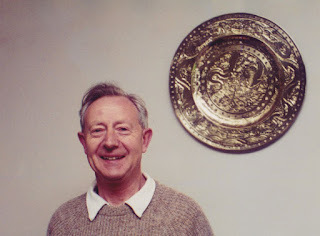 Dad was quite different - studious rather than entrepreneurial, working hard at Worcester Grammar School and being offered a place to read history at St Edmund Hall, Oxford, a.k.a. Teddy Hall. By all accounts he was a very serious young man with a great interest in Roman Catholicism to which he had converted from Anglicanism. He found he had a vocation to the priesthood, and, rather than taking his place at Teddy Hall, began his Oxford studies instead at the Jesuit college, Campion Hall, where he read Classics. The direction of his life changed again after he started corresponding with a girl he had met on a train in Germany. It led to romance and a decision to marry rather than enter formation for the Catholic priesthood. After graduating from Oxford University, Dad had to do national service in Germany. With the passing years, his time in The Army was viewed through rose-tinted glasses. Although I am assured he was not at all keen on the military life at the time, afterwards he liked to talk with enthusiasm about his service as a general's chauffeur, and particularly the stark contrast between his dignified and sober boss and a hard-drinking, boisterous American general who was the life and soul of the party whenever he rolled up in his Jeep. My parents married in my mother's home town, Bremen, in northern Germany, and he and Mum moved to Derby where he embarked on a career with British Gas. He started as a management trainee, a role he said came with a company bicycle, which, at first as least, he kept in their bedroom - to ensure it remained pristine. Dad became a commercial sales manager, working in gas board jobs in Scunthorpe, where I was born, Aylesbury, Oxford and Poole in Dorset. In Poole, he would shift his working day forward in the summer months to try to come home early to take us to the glorious beach at Sandbanks in the family motor, a formidable Morris Oxford. We enjoyed many happy times at the beach, jumping the waves, crashing through the white water, and having sprints along the sands. Although not as tall as his sons, Dad had a real turn of speed over 100 yards. I have vivid memories of life with him in Broadstone, Poole. Looking back, he was a remarkably tolerant father in many ways, although his natural cautiousness, particularly about road safety, meant we were strongly discouraged from riding bicycles on the roads until we were in the sixth form. In his own way he always tried his best for us. 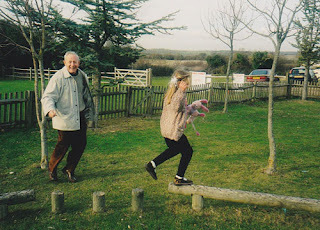 When I failed my 11+ exam and was sent to Poole's secondary modern school, I was very unhappy. He and Mum moved heaven and earth to help get me transferred after one just term to Poole Grammar School. When we received notification of my transfer, a riotous night of celebration and barley wine drinking ensued at our home in Charborough Road. Dad had his own philosophy. He did not generally believe in over-exerting himself. His words of wisdom to us included: "Burst not thy boiler! ", "Throttle right back", and "I do what I can, I can no more." 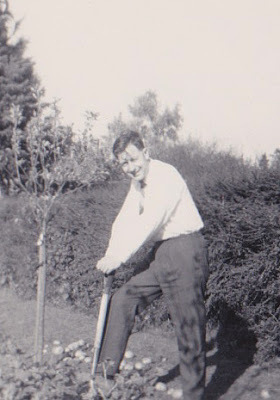 However, at times he worked incredibly hard, on projects such as digging a very deep trench in the front garden to try to divert an underground stream which had been flooding my bedroom (our house was built on the side of a steep hill) and converting, decorating and insulating our new house when he and Mum moved from Poole back to Oxfordshire. 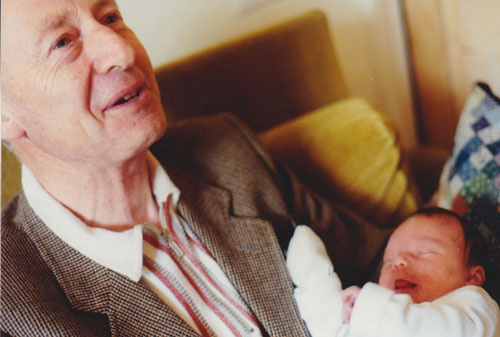 He was a proud grandfather and was delighted when his first granddaughter was born in 1990. When she was a toddler, he would her horsey rides on his back. And he also loved his four other granddaughters. There was a serious side to Dad but also a fun and mischievous side. He enjoyed a good gossip about politics and was not averse to stirring things up a bit. For years he was nicknamed "Gwalt" - from Gwalterus, the Latin for his first name Walter, which we had espied on his graduation certificate - and, somehow, the name became synonymous with naughtiness. 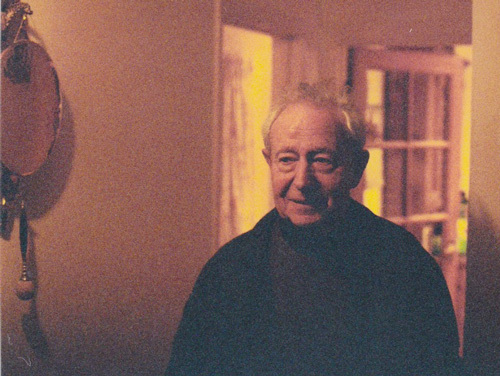 Sometimes, he would march far ahead of us in the street in Oxford, gradually disappearing from sight, or join a passing religious procession, vanishing into a college chapel for Evensong! For his amusement, he compiled his own Anglo-Saxon dictionary, free of words of Latin and Greek derivation, and some of them his vocabulary. Sometimes he would correct me when I said "telephone" or "horizon", substituting his preferred words "farspeaker" and "skyline"! He loved to watch his granddaughters playing when they were little. 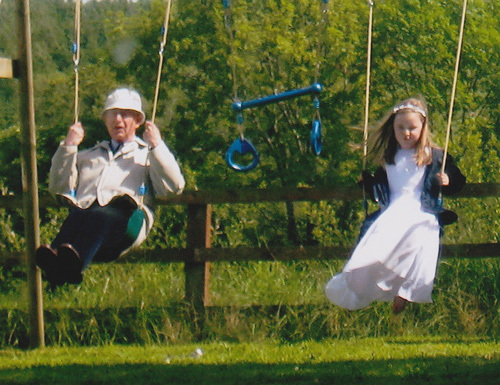 One of my favourite photographs is of Dad and his granddaughter Emily on playground swings. Life with Dad was full of surprises. He did not like travelling through London, even on public transport, so once when we embarked on our annual holiday, he hired a couple of Jaguar limousines to bypass the Metropolis. On the other hand, journeys in the Morris Oxford could be very long and demanding. The joy of seeing the sea at Weymouth after a seemingly interminable drive from Oxford was immense. And, later, on trips from Poole to Oxford, we were offered a round of ice creams for every minute the Morris Oxford brought us late to the 9.30am mass at Blackfriars. So many ice creams were won by me and my brothers; most of them, of course, never materialised! On motorway, 50mph was considered a great velocity in the Morris Oxford. Generally, 'A' roads were preferred. 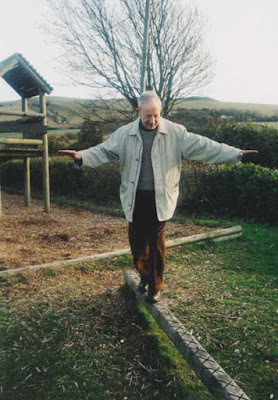 Dad could be anxious, especially when we were learning to drive, but there was a more general peacefulness about him. 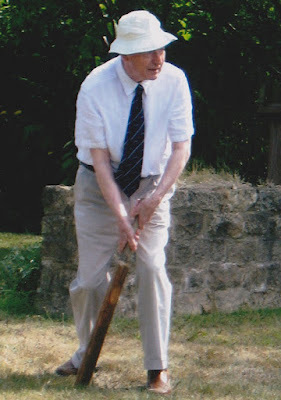 He loved the outdoors, whether among his apple trees, playing garden cricket or going the dreaded Sunday "run in the Cotswolds" - a lengthy car excursion. I regret that during periods of my life I did not see as much of him as I might have done, although in recent years I have visited a lot. His disease, Alzheimer's, was very gradual at first, but became much more severe in recent years and, particularly, this year at Freeland House, Oxfordshire, where the carers and nursing staff were wonderful. 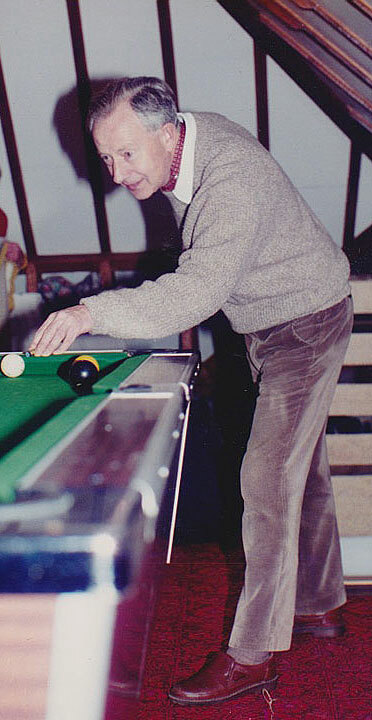 Dad was a regular at Blackfriars, Oxford, for decades. He and mum had attended their 9.30am mass from the days when Geoffrey Preston OP and Malcolm McMahon OP were part of the community there. 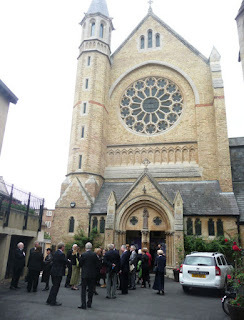 Dad also enjoyed the tradition of the Oxford Oratory, St Aloysius Gonzaga, with his Latin mass. So, in a way it was fortuitous that a ceiling issue had put Blackfriars' church out of action, so the Prior John O'Connor celebrating Dad's Requiem Mass instead up the road at St Aloysius. 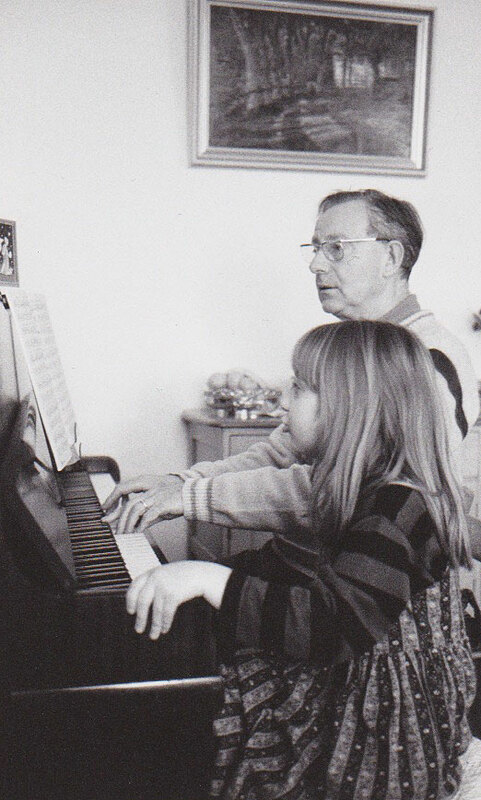 He would have loved the hymns, favourites such as Praise to the Lord, the Almighty, the King of Creation, and Tell Out My Soul, the Greatness of the Lord, and the stirring organ music. 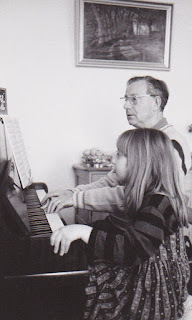 Dad loved playing the organ and was such a fan of J S Bach (1685 - 1750) that he has taken Johann Sebastian as baptism names when he entered the Roman Catholic faith. Fr. John spoke very well about Dad, taking our stories about him and perfectly capturing his unusual amalgam of gentleness, faith, eccentricity and humour. Dad would often leave a church service with the jaunty remark: "A useful little mass!" This was his final mass. Afterwards, the funeral cortege drove up to Cumnor where he was laid to rest beside the village church, St. Michael's, as the heavens wept. It is hard to get used to life without him. It feels there is a big void. We are left with happy memories and golden photographs of Dad, some of which I share here.